In his latest deviation from tradition, the maverick President Duterte decided to drop honorifics from official communications. 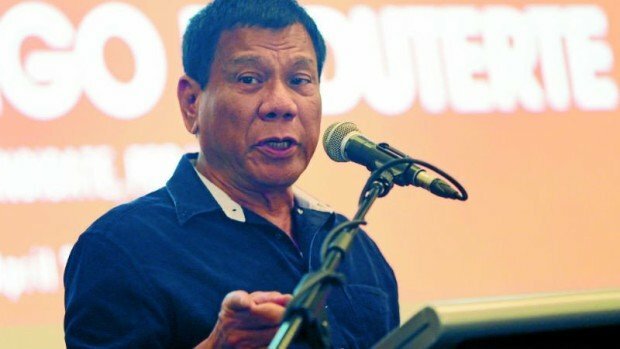 He now wants himself to be referred to simply as “President Rodrigo Roa Duterte” in all official communications, events and materials, according to a memorandum signed by Executive Secretary Salvador Medialdea. “All members of the Cabinet shall be addressed in all official communications submitted to the Office of the President as ‘Secretary’ only,” Medialdea said. In internal communications and documents, however, the heads of government agencies and offices may still be referred to as “Honorable,” he said. The memorandum was sent to all departments, bureaus, Cabinet members and heads of agencies, government-owned and -controlled corporations, state-run financial institutions and other government offices. The President issued the order to lessen the ceremony in official communications, presidential spokesperson Ernesto Abella said. “In keeping with his populist presidential style, he encourages less ‘ceremonial’ communications,” Abella said. Since assuming the presidency on June 30, Mr. Duterte has repeatedly shunned tradition. He chose to take his oath of office in Malacañang instead of at a mass gathering in Rizal Park to avoid causing heavy traffic in gridlocked Manila. His inauguration was also held separately from that of Vice President Leni Robredo. Mr. Duterte also refuses to take special flights and instead flies economy on domestic airlines in going home to Davao City. Even presidential fashion has changed, with Mr. Duterte wearing barong Tagalog over jeans at military parades, with the sleeves of the traditional men’s shirt worn for formal occasions rolled up. He was not the first President to roll up the sleeves of his barong, though. President Fidel Ramos worked at his desk in Malacañang and appeared in public with his barong’s sleeves rolled up. In his first address to Congress on Monday, Mr. Duterte has ordered guests to wear business attire, doing away with the long-running custom of lawmakers parading on the red carpet in ostentatious suits and long gowns. Even television reporters covering the event wear barong and floor-length gowns, competing with the lawmakers and their spouses for attention in what has become an annual congressional fashion show. This time, however, television networks and newspapers planning their coverage of the event with special attention to the fashion show will be disappointed. “We will downplay the event. It will not be a fashion show,” said a spokesperson. The honorific “Your Excellency” or “His/Her Excellency” used to refer to the President of the Philippines was adopted from the title of the governor general of the Philippines during the Spanish and American colonial periods. Several other countries also use this honorific to refer to their leaders, including Ireland, Kenya, Pakistan, Sri Lanka and governors of some states in the United States. In 2012, India’s President Pranab Mukherjee approved a new protocol forgoing being called “His Excellency” within the country and instead used “Hon’ble” before the title President. “His Excellency” was to be used only when he interacted with foreign leaders according to customary international practice. “His/Her Excellency” is also a courtesy title used when addressing foreign officials, including high foreign national officials such as a president of a republic and foreign diplomats with the rank of ambassador and accredited minister. It is also the form of address used by the United Nations for heads of state.